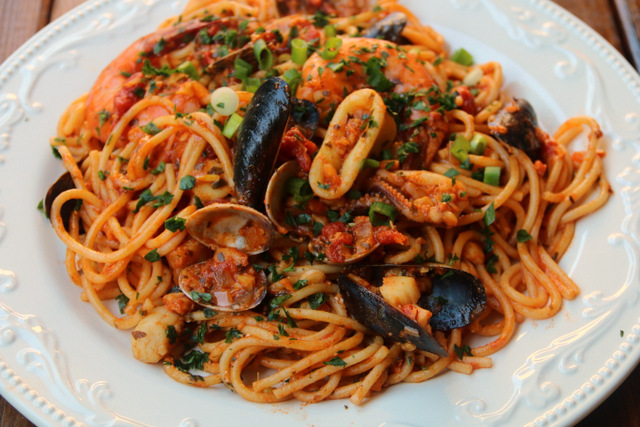 This is my easy recipe for Latin style seafood spaghetti; this delicious dish is made with a mix of seafood cooked in sauce of tomatoes, onions, garlic, cilantro, cumin, achiote and chili powder. 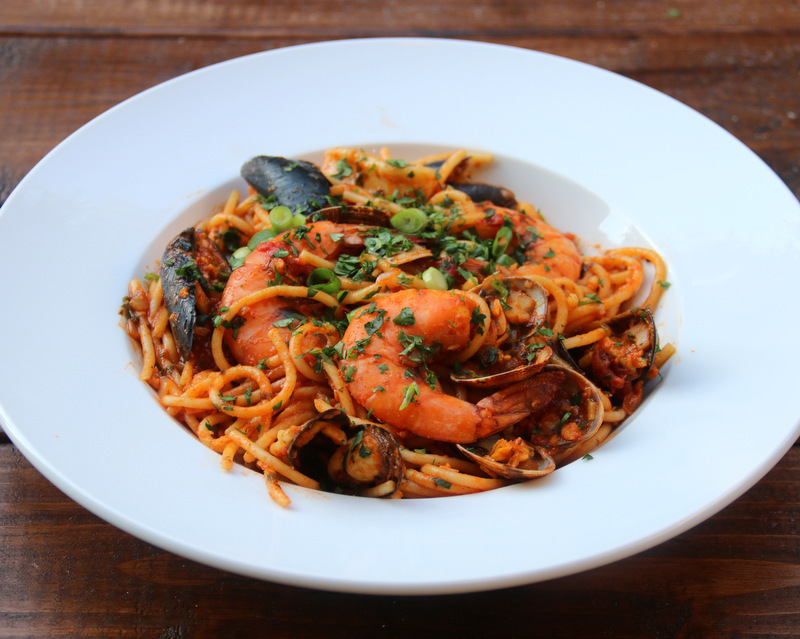 Seafood spaghetti, known as tallarines con mariscos or tallarin marinero in Latin America, is a perfect example of the fusion of Italian food in Latin America. 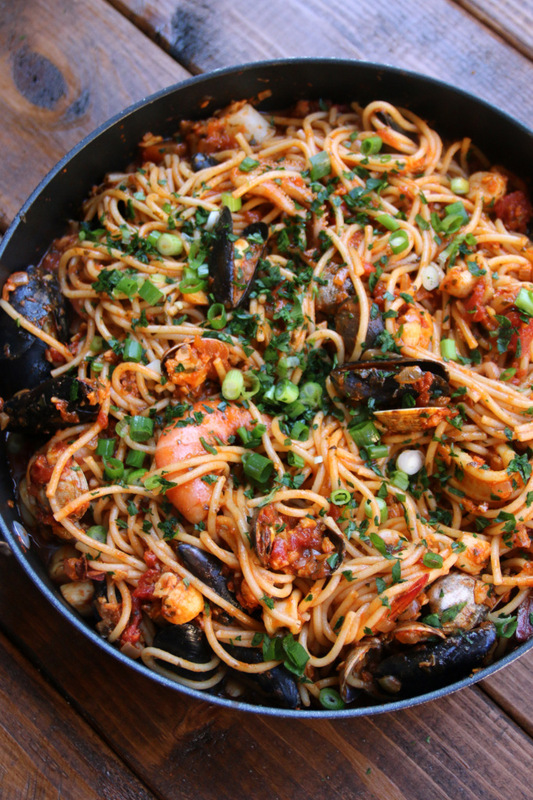 I love Italian spaghetti dishes, but I am so used to having them prepared with Latin spices like cumin, chili powder, and achiote or annatto. 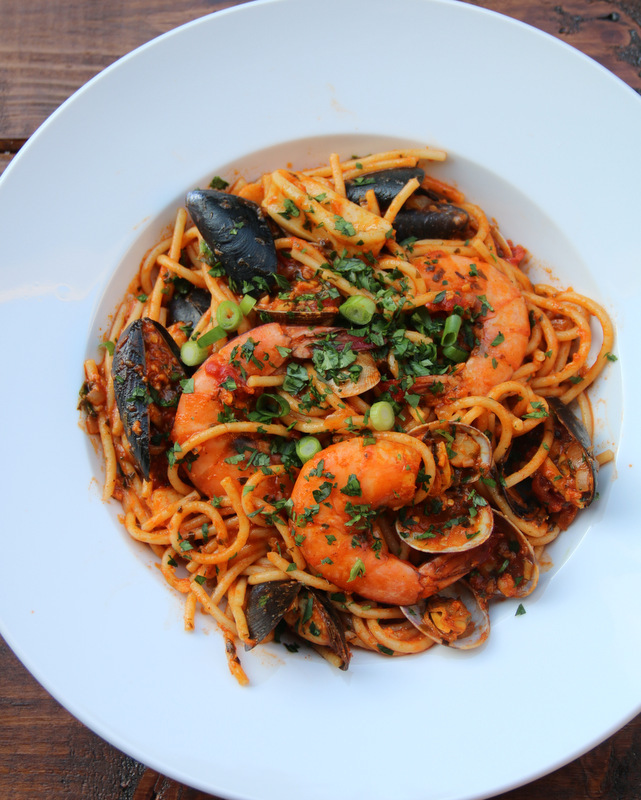 Latin style seafood spaghetti recipe, or tallarines con mariscos, made with a mix of seafood – fish, shrimp, mussels, scallops, clams, and calamari - cooked in a sauce of tomatoes, onion, garlic, cilantro, cumin, and achiote. 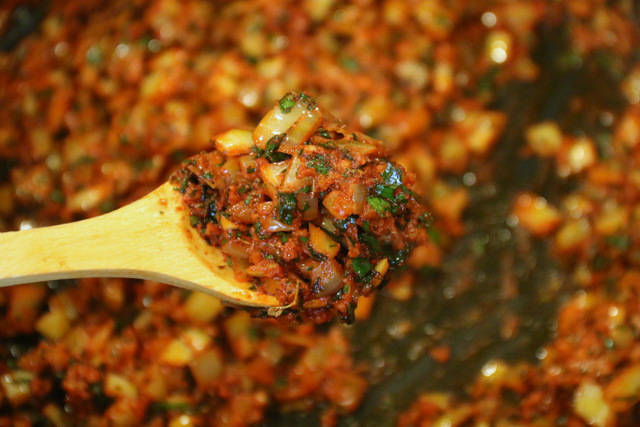 Add the diced onions, crushed garlic, chopped cilantro, chopped parsley, dried oregano, cumin powder, annatto powder, chili powder, and a little bit of salt. Cook for about 5 minutes or until the onions are translucent and soft. 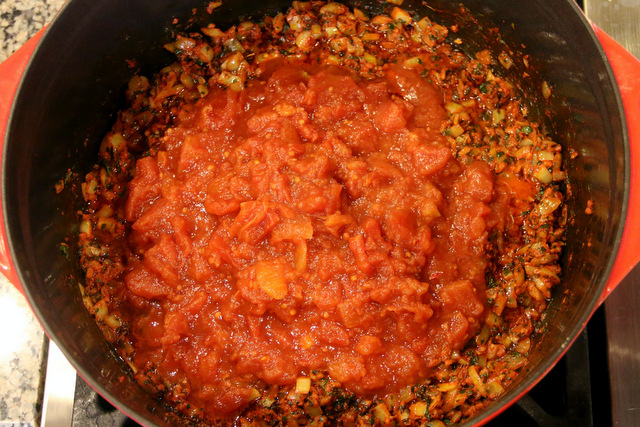 Add the diced tomatoes and cook for another 5 minutes, stirring occasionally. 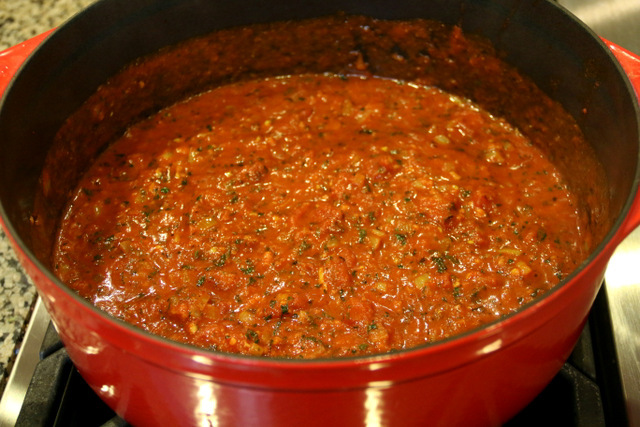 Add the broth and the tomato paste, mix well and cook for another 10 minutes, stirring occasionally. Add the fish and cook for about 5 minutes. 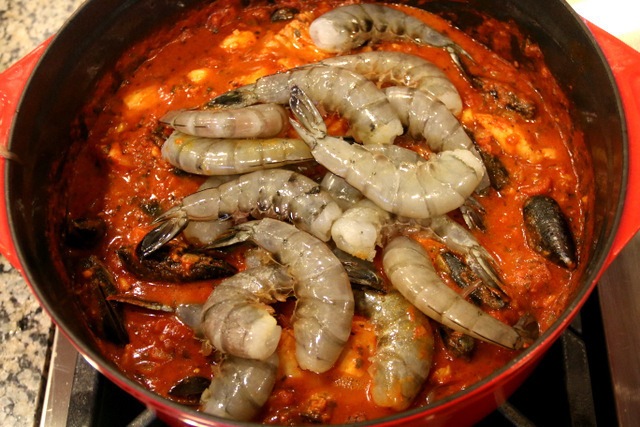 Add the shrimp and cook for about 3-5 minutes, time will vary based on the size of shrimp. 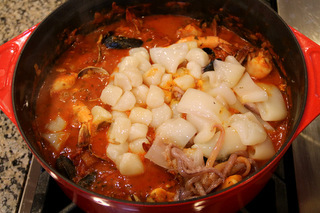 Add the calamari and the bay scallops, cook for another 3-5 minutes or until all the seafood is fully cooked, but not overcooked. 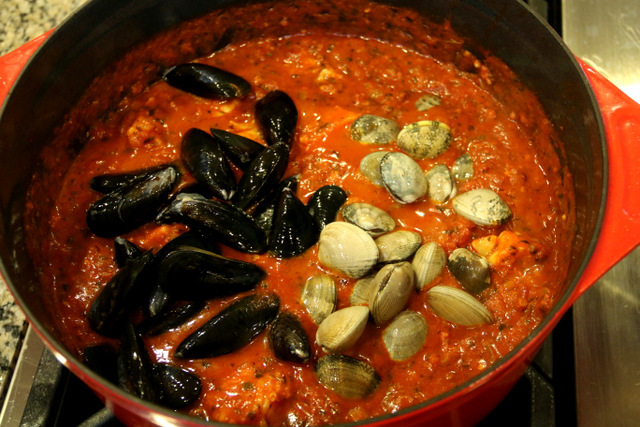 Taste and add salt or additional seasonings as needed. 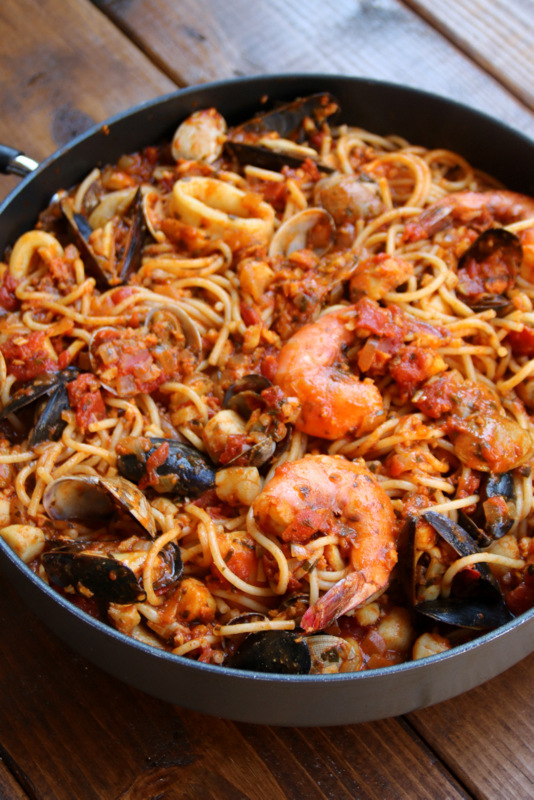 Mix the seafood sauce with the cooked spaghetti. 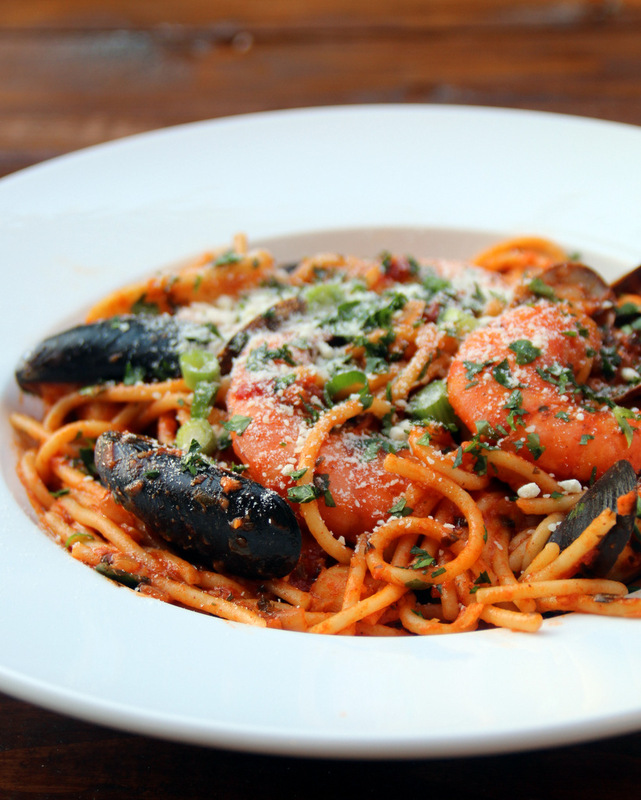 Serve the seafood spaghetti sprinkled with chopped green onions, chopped cilantro, and grated parmesan cheese. 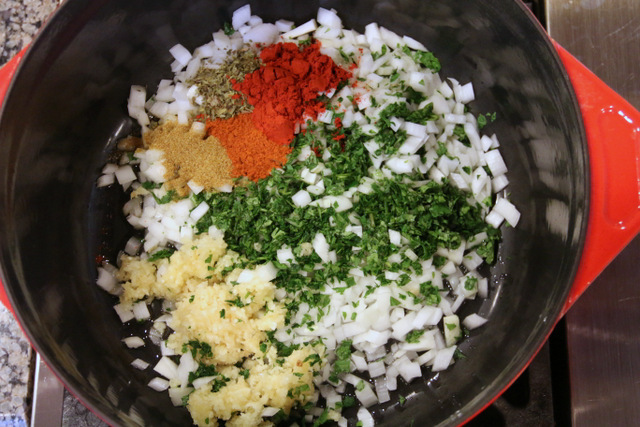 I start by making a refrito or sofrito with onions, garlic, herbs, and spices. 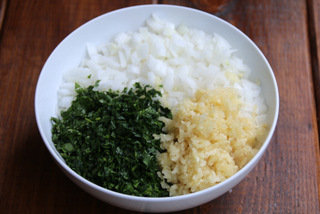 Refrito or sofrito consists of sautéing a mix of diced/crushed veggies, chopped herbs and spices that serve as a flavor base for so many Latin dishes, from soups to rice and pastas dishes. 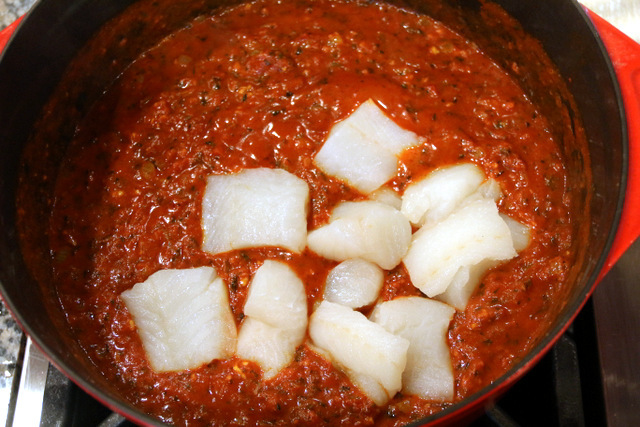 A sofrito also helps builds layers of flavor, as soon as the onions and garlic are translucent and tender, you add diced tomatoes and let them cook until soft. 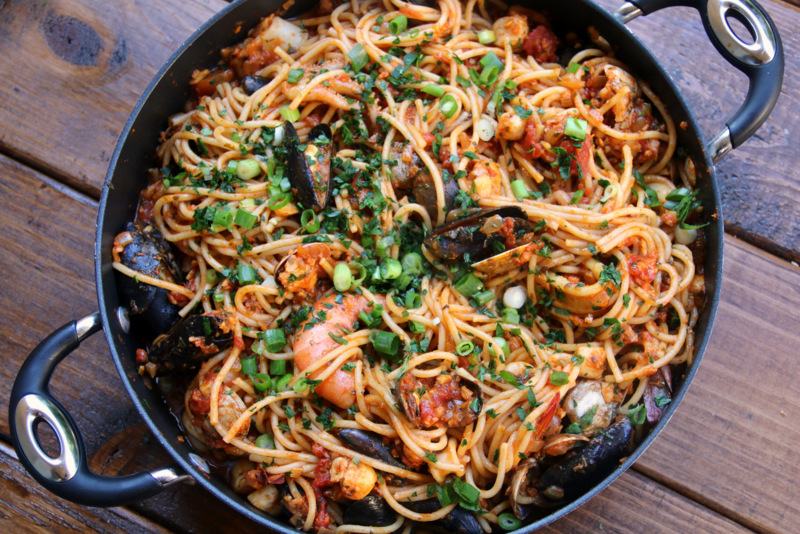 There are many variations of refrito or sofrito, some can be blended into a smooth sauce and made in advance, while others – like the one in this seafood spaghetti have a more chunky consistency – the exact ingredients and amounts of spice vary based on the cook’s taste. Feel free to adjust any of spices and herbs based on your taste preferences. 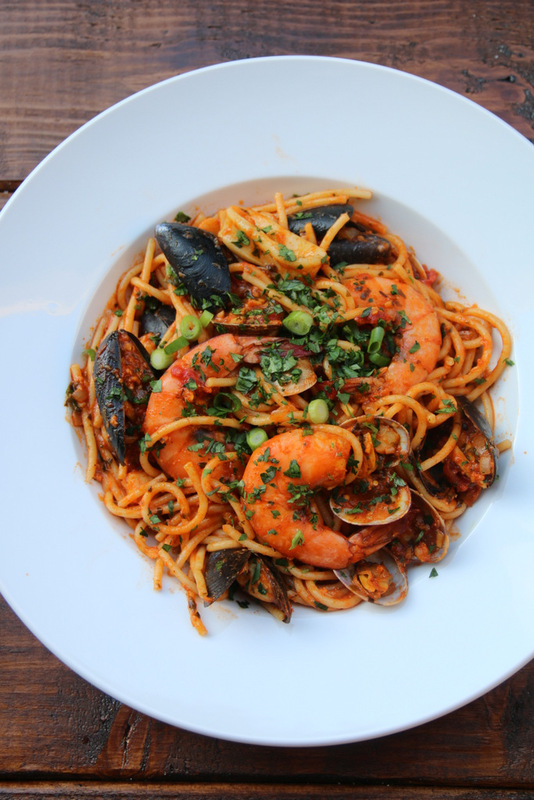 When I first started cooking, I used to think of mixed seafood dishes as complicated and time consuming to prepare, but I quickly realized that it’s the opposite. 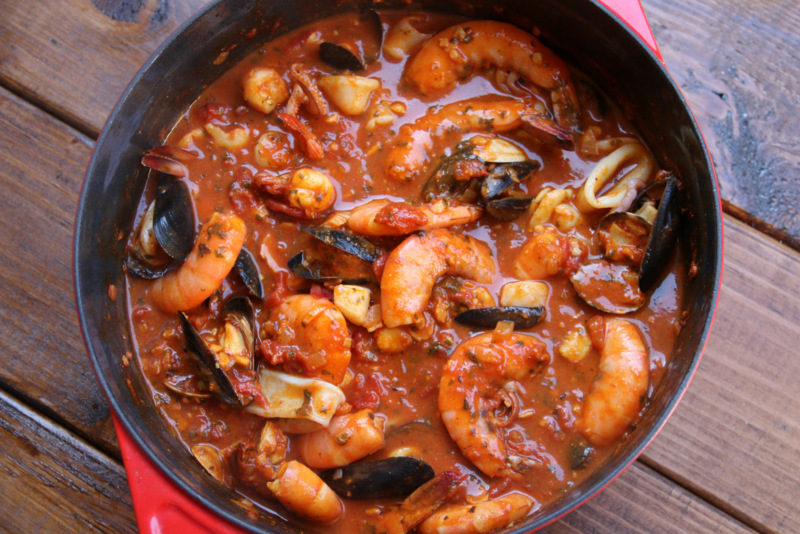 Seafood cooks very fast and adds a lot of flavor to any dish, making it a great protein to use when you want a meal that can be prepared quickly and still be impressive – both for a weeknight family meal or for a weekend dinner party. 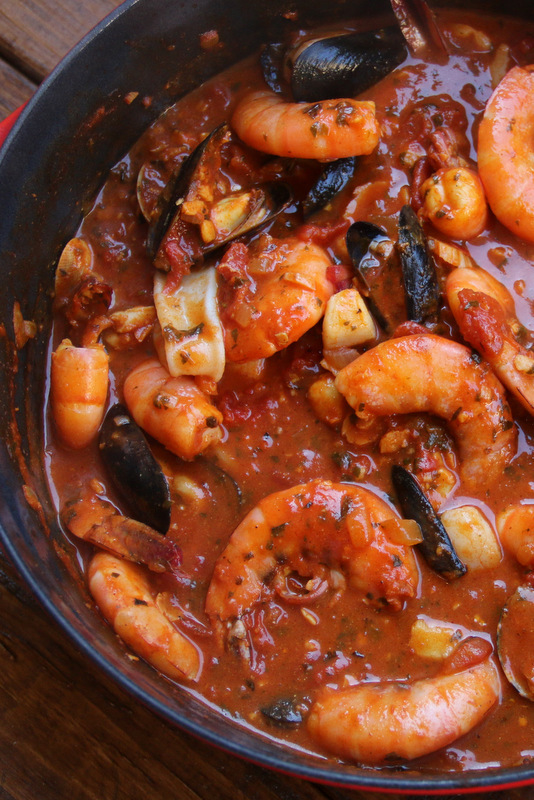 You can do most of the prep work for this dish in advance. I usually chop the veggies ahead of time and have them ready to go. 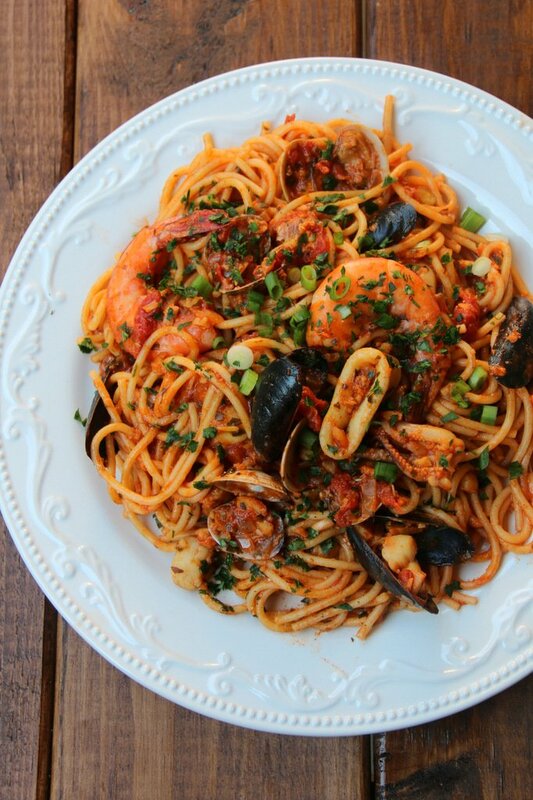 Another way to simplify the preparation for this seafood spaghetti dish to use canned diced tomatoes. 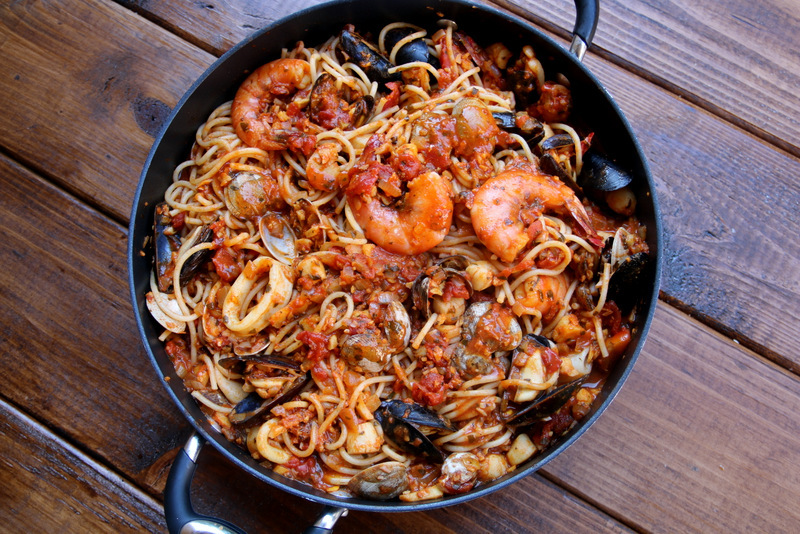 You can use the assortment of seafood that you prefer or what is easily available to you. 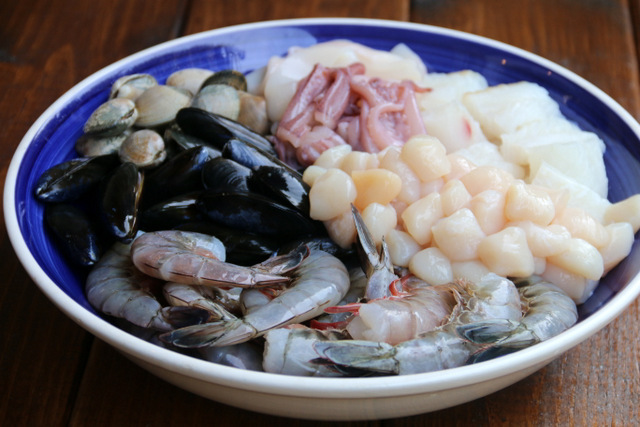 If I have time, I’ll try to stop by the local fishmonger and choose a selection of what looks best. 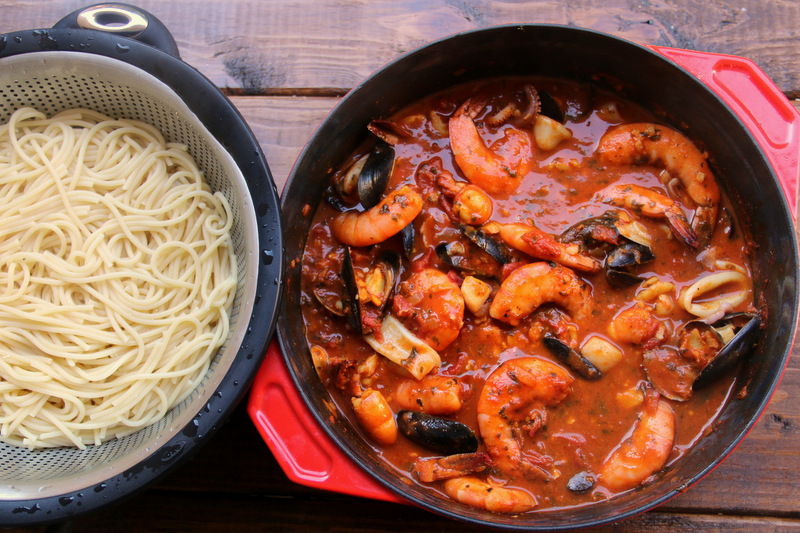 I also usually keep a pack of frozen mixed seafood in the freezer and will let that de-frost overnight – the mixed seafood packs are perfect for making this or other pasta dishes, they also work great for a quick last minute mixed seafood rice or a simple seafood soup. 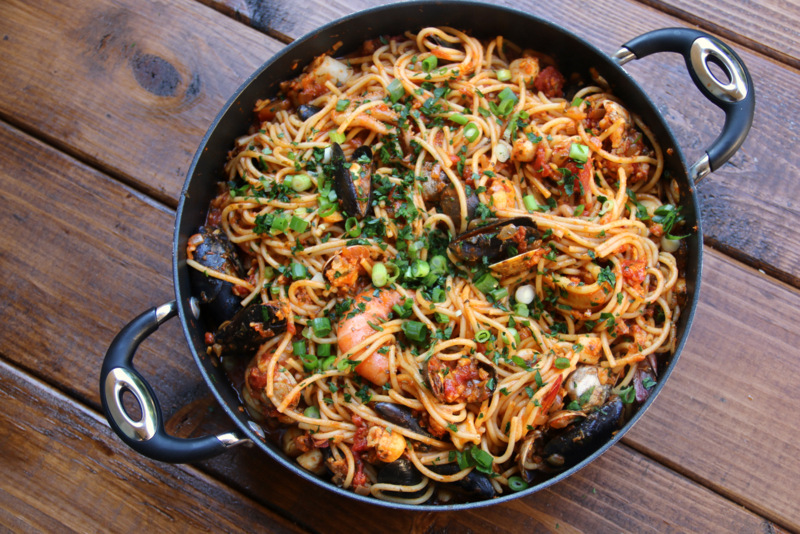 The quantities in this seafood spaghetti recipe are enough for 8-10 people, so for a family of four, you will definitely have leftovers for the next day or to freeze for later on. 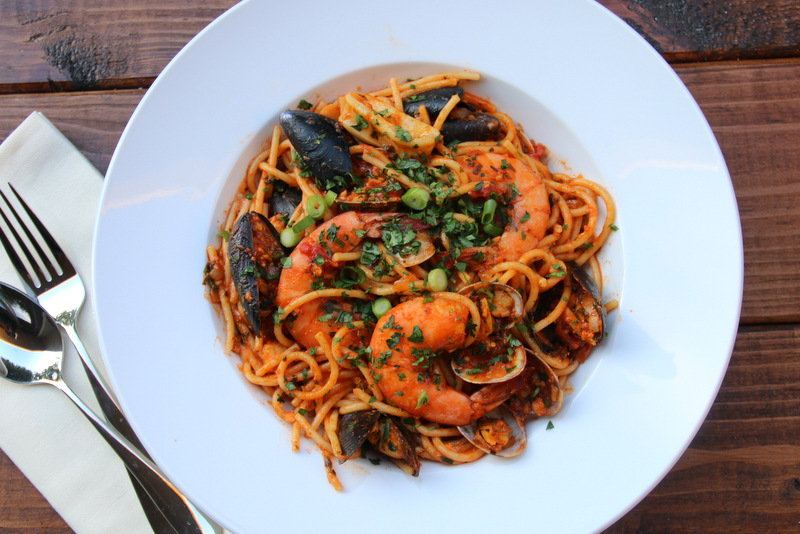 I served these tallarines con mariscos sprinkled with grated parmesan cheese, freshly chopped cilantro, and chopped green onions. 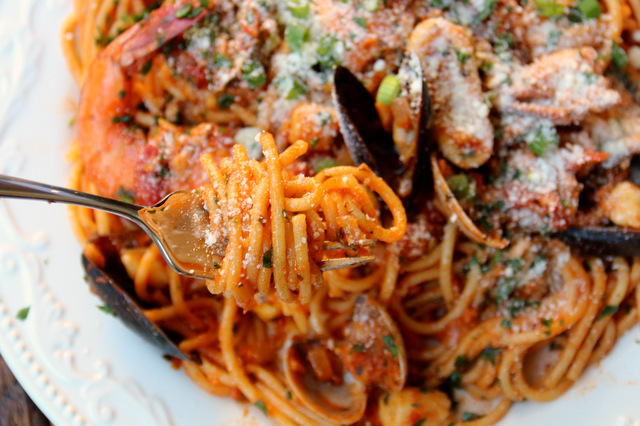 *Disclaimer: This recipe was originally created as part of a partnership with the KRAFT brand. All photos, recipes, opinions and ideas are 100% my own. 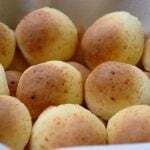 I have made this recipe a few times and it keeps getting better! I went to a south American restaurant and had something similar and paid over $20 for it. I spent $60 making it at home and 12 of us ate. 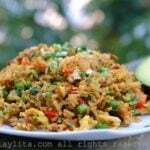 what, if anything can be substituted for the achiote or the annattto? the recipe for the sphagetti sound exciting. You can use paprika if you can’t find achiote/annatto.